International carrier Philippine Airlines (PAL) has selected SITAONAIR to make its global high-speed connected passenger experience ambitions a reality over GX Aviation.SITAONAIR is to deliver the upgrade of PAL’s existing B777 Swift Broadband fleet to GX Aviation, powered by Honeywell’s JetWave SATCOM terminal, together with line-fitting PAL’s new Airbus A350s and A321s. Once complete, SITAONAIR will activate its rich nose-to-tail package of bespoke inflight connectivity (IFC) services, achieving a significantly enhanced and consistent connected experience for passengers and cabin crews. SITAONAIR’s award-winning, intuitive Internet ONAIR portal offers contextualized and personalized content, satisfying digitally-demanding passengers over GX connectivity by mirroring their ‘at-home’ experience, and with free 30-minute Wi-Fi sessions and cheaper price plans on offer to all passengers. In addition, PAL customers will benefit from SITAONAIR’s mobile connectivity over GX via SITAONAIR’sMobile ONAIR; ONAIR Plug’s secure online channel for inflight card transactions and crew and passenger interactions; plus integrated, connected inflight entertainment from Zodiac Inflight Innovations. The close partnership between SITAONAIR and Zodiac Inflight Innovations with PAL plays an important part in the program’s success. 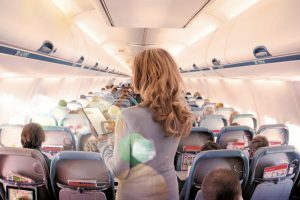 In April PAL announced their selection of SITAONAIR’s state-of-the-art CrewTab solution to digitize cabin crews’ operations. Coupled with GX connectivity, this solution’s capabilities will further optimize the customer service experience and efficiencies CrewTab-equipped cabin crews can deliver in flight. Find out how SITAONAIR can help you create your connected aircraft reality today – visit sitaonair.aero, speak to your nearest SITAONAIR contact, or submit an enquiry form.